Looking for a flooring choice that can last for years, stand the test of time, and look great in the process? Hardwood flooring is the answer. What makes hardwood flooring a great choice is you can live with them indefinitely as installed, or change them as you desire. Refinish them and you can change the color to anything you please, from a light, airy color, to a darker, richer tone. And because of the underlying qualities of most woods chosen for a floor, it doesn’t matter how dark or light you choose, simply sand and refinish and you’re ready for the next color. When you choose a solid hardwood floor, it can be sanded and refinished many times (unless it’s so old and worn that it’s down to the tongue and groove). This often takes generations to bring it down to this level. Which means if you choose to have hardwoods in your home for decades, you can do so and have the ability to change the color every once in a while. Keep in mind there is a difference between solid hardwood and engineered hardwood, Engineered hardwood cannot be refinished as many times as solid hardwood, with it depending on how thick the top layer is and how the wood installed, as floating floors cannot be sanded. Care is relatively easy. Regular sweeping and vacuuming will keep dirt and debris away from the floors. If spills occur, clean immediately without allowing water to soak into the wood. And when the time is right, you can refinish easily. First, sand the floors with a sanding machine. Grit depends on the age and the type of wood. This ensures the hardwood is smooth and that it will properly accept the stain and finish. Next, stain the wood any color you desire. Different woods accept stain in different manners. Always test a small spot before you apply stain to your entire room. Finally, add polyurethane to help smooth out the floor and absorb and protect the wood underneath. Polyurethanes come in both water and oil based, and come in a variety of finishes, from matte to glossy. Satin finishes are currently the most popular, and are great for most rooms in your home because they tend to show scratches less than other finishes. 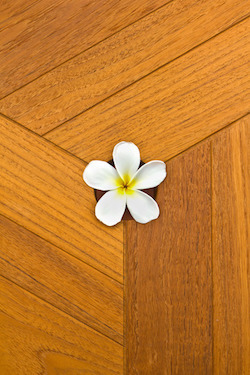 You do have to sand and remove all stain from hardwood floors before you apply a new color or stain. You can’t just apply a new color or stain when you decide to redecorate your room. So be prepared for the process of sanding and refinishing when you decide to do it. Have any other questions about the process?